Is there more to the genus Homo than we think? Almost 300 years ago, Linnaeus defined our genus Homo (and its species Homo sapiens) with the noncommittal words nosce te ipsum (know thyself). Since then, fossil and molecular biology studies have provided insights into its evolution, yet the boundaries of both the species and the genus remain as fuzzy as ever, new fossils having been rather haphazardly assigned to species of Homo, with minimal attention to details of morphology. A paper published in today’s issue of science magazine by Jeffrey Schwartz and Ian Tattersall argues that, historically, fossil specimens have been “shoehorned” into Homo species “without regard to their physical appearance”. They overview recent examples of debate to illustrate significant differences in the ways that researchers are willing to group specimens. 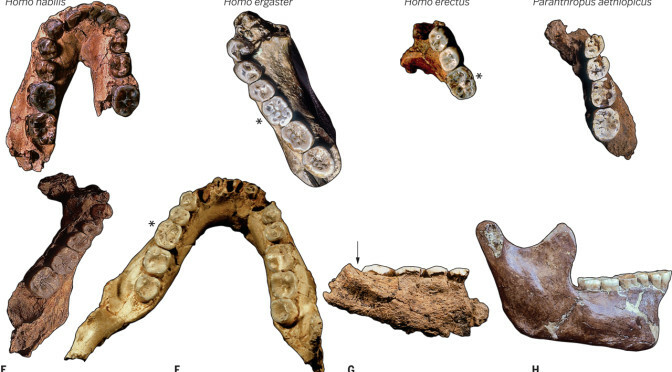 They also picture several fossil specimen examples of homo to highlight marked differences between them. The paper calls for a revisit of criteria for species recognition. The reason being that historical classification schemes, and subjective assignment of new fossils, may be limiting how we can build testable models of human evolution.